Planning a wedding is quite an exciting experience for the couple. Top of the list of considerations is the wedding color, as the couple aims to leave a lasting impression in the guest’s mind. How, then, do you choose the right colors for your wedding? Below are a few tips. The wedding venue determines the color combinations that you can use. For example, bright colors like orange, yellow and pink are suitable for outdoor weddings. For beach weddings, colors like aqua, turquoise, and teal will complement the colors of the sea beautifully. For indoor weddings, bright colors combined with black, silver or gray are appropriate. Decide what mood you want to set. The first thing your guests observe when they get to the venue is the wedding color. You need to choose colors that will not only sweep them off their feet but also put them in the right mood. For instance, a black and white combination is formal, while pinks and yellows create a playful mood. 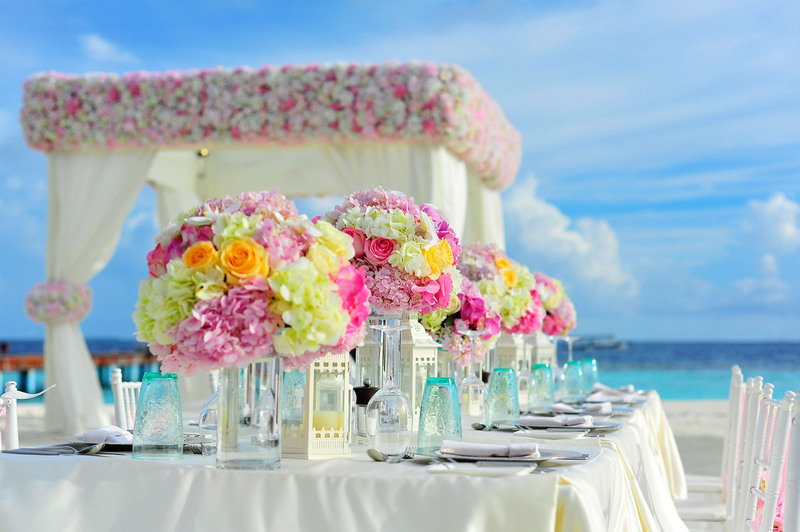 A wedding that takes place during hot, sunny weather can have either bright, flowery colors or their toned-down versions. If you expect to have your wedding ceremony during the rainy or cold seasons, choose colors that will brighten up the grayed-up atmosphere. Using exciting colors for a wedding on a cold day will make your guests more cheerful. If you and your partner have a favorite color or a favorite flower, use either as a basis for your wedding color scheme. The chances of your color scheme turning out great are higher if you go with something that you love. Also, you can choose a similar color if the exact color you want is not wedding friendly. Remember that the guests should see your personality in your color scheme. Pick a color that is effortless to find. To ensure the consistency of your color scheme all around the venue, pick an easily available color. You do not want to find that your bridesmaids are wearing different shades of your favorite color. To simplify the process, select a standard base color and then combine it with a unique color. There is plenty of online information on color combinations. View the different color combinations, and check out the trending colors for the season when you intend to wed. The color wheel comes in very handy when choosing colors for a wedding. Select your primary color, and then decide if you want to combine it with the color directly opposite, or the ones next to it. Don’t choose more than four colors. While too little color appears boring, too much color disturbs the eye. Choose your base color and its complement, and then use additional colors sparingly. Most people prefer sticking to two colors. Choosing your wedding color is not that hard after all. Follow these simple steps, and people will be talking about your beautiful wedding for a long time!